Sooner or later everyone needs a helping hand, a "big brother" or "big sister" to reach out in kindness and love and guide them through the trials of life. 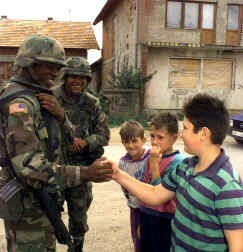 The town of Brock in the northern part of war-torn Bosnia is home to many such boys and girls. It is a town rebuilding from the aftermath of tragedy late in April 1992 when Serb militias swept through the river port town murdering non-Serb residents and sending thousands more fleeing their homes to any place of refuge. Evidence of the horror of 1992 and the years of fighting that followed is still seen throughout the city, but there is a ray of hope. American soldiers carefully patrol the streets from day to day. They are not there as combat soldiers, though at any moment they face the possibility of immediate danger. They are there as part of a peacekeeping force. As they go about their duties, their hearts break for the young children. They reach out a hand in friendship, give a hug here and a word of encouragement there. They minister to medical needs, hand out much-needed school supplies sent to them by volunteers back home, and do their very best to be a "big brother" or "big sister" to the innocent victims of the Bosnian conflict. Then, at night, they return to their small military post on the outskirts of the city. As they pass through the gates they can't help but notice the sign declaring the name of their outpost, or the tradition their service to the children represents. The name itself reminds them of an American family who almost fifty years earlier sent two young soldiers much like themselves to defend the freedom and dignity of people in another war-torn foreign country called Korea. The eldest brother was a First Cavalry trooper like themselves, a patriot with a heart for others. His name was Robert McGovern, a name almost forgotten by many who live in the Nation for which he served. His care for others, his courage on the battlefield of Korea, and the sacrifice he, his younger brother Jerome, and the entire McGovern family made for freedom is now rekindled at Camp McGovern in Bosnia. Robert McGovern looked every bit the part of an "All American" young man. Born in Washington, D.C. in 1928, he grew up in our Nation's Capitol in a close family with a modest but happy home in the Petworth neighborhood. In time the family of Mr. and Mrs. Halsey McGovern would grow to six, four boys and two girls. John was the oldest, three years Robert's senior. He was a World War II veteran who had served with the Army Air Force as a flight engineer on a B-24 bomber in the Pacific, while at home his younger brothers and sisters feared for his safety and prayed for his return. Sister Margaret Jane was a year older than Robert, and Jerome was little more than a year younger. Brother Charles and sister Elizabeth completed the large and loving family. The McGovern family insisted on a solid education for their children and believed that such an education could be found at nearby St. John's College High School. Among the outstanding programs at the school was their Cadet Corps. The Drill Team was a tremendous source of pride for the school, marching in many Capitol activities including the 1917 Inaugural parade for President Woodrow Wilson. The oldest McGovern son graduated from St. John's in the spring of 1942. That same fall Robert entered the school. Two years later Jerome followed in their footsteps. Both Robert and Jerome became part of the Cadet Corps, not only marching and drilling with pride but also showing an almost innate leadership quality. The two young men were brothers, they were also friends. When Robert McGovern graduated from St. John's in 1946, he enlisted in the Army. 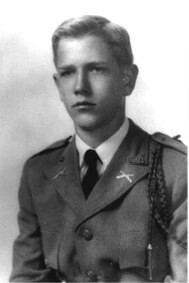 After basic training, the young Army private attended Officer Candidate School at Fort Benning, Georgia. Before his 20th birthday he was commissioned as a second lieutenant and by 1949 he found himself stationed at Camp Crawford in Japan. Robert McGovern was a good soldier, a fine officer, and an American patriot. These were character traits he had learned in his family and seen reinforced at St. John's. Robert McGovern also had a deep Spiritual side. The Christian Brothers at St. John's instilled in all their students, a compassion for the needs of others and a responsibility to be their "brother's keeper". These lessons followed Lieutenant McGovern to Japan, a country still reeling from the after-effects of World War II. Robert's heart broke for the orphans around him, the innocent children who needed so much and had so little. He began volunteering his spare time to help at a local Franciscan orphanage in Sappora, but he could see his efforts alone would not be enough. Finally, he wrote home: "Since the occupation began these nuns have fallen heir to the babies of the Army. In touring the buildings I grew disgusted with the lack of help these people are receiving from Catholics Stateside. Thirty-eight babies are crowded into a 20 by 50-foot room, and one out of three dies from advanced malnutrition and high susceptibility to disease." Back home in our Nation's Capitol, his words struck a nerve and moved hearts. When the words of his letter reached the Good Samaritan Society, packages began arriving in Japan. The orphanage received complete sets of inoculations for the children, powdered milk, bedding, clothing and more. Robert McGovern continued to share the conditions faced by the innocent children of Japan in letter after letter. Compassion poured out at home and spilled over to a neighboring orphanage in Osaka, Japan. 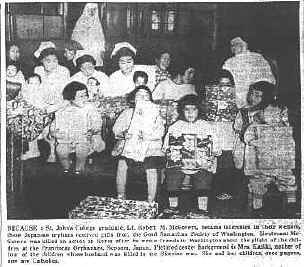 By the time 100 Christmas packages arrived in 1950, Robert McGovern was no longer in Japan to welcome the gifts for the children who had touched his heart. Instead, he was facing a hostile enemy in the bitterly cold mountains of Korea. In truth, Robert McGovern didn't become a hero in Korea that January day in 1951 that brought him our Nation's highest honor. To hundreds of Japanese children, Robert McGovern was a hero long before he arrived on the battlefield. Robert's younger brother, Jerome, graduated from St. John's in the Spring of 1948. Like the elder, he joined the army, enrolled in Officer's Candidate School, and was commissioned a Second Lieutenant at Fort Riley, Kansas while his brother was serving in Japan. Airborne training followed, then in the Summer of 1950, Jerome was sent to Japan to join his brother as a member of the 187th Airborne Regiment. It was an unexpected reunion, the first time to two brothers had been together since Robert had entered the service. The tranquility of their time together didn't last long. On the early morning of June 25, 1950, nearly 100,000 members of the North Korean People's Army swarmed across the 38th parallel in an effort to crush the democratic Republic of South Korea. In October the brothers parachuted with their regiment into the Kimpoo Airfield in North Korea. Their baptism of fire was almost immediate. A shortage of officers made the chances of serving close to each other impossible. First Lieutenant Robert McGovern was assigned to the 5th Cavalry Regiment of the 1st Air Cavalry Division. 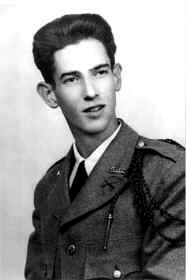 Second Lieutenant Jerome McGovern was assigned to the 9th Infantry Regiment, 2nd Infantry Division. Within months each would prove his leadership skills, demonstrate his courage, and come to exemplify all things good they had learned at home and at St. Johns. Throughout the winter, the two brothers were too busy leading their troops to maintain much contact. They wrote home frequently, but the bitter warfare and the coldest winter in 100 years made their first concern one of simple daily existence. As Christmas presents were arriving for the orphans in Japan, Robert McGovern was fighting for his life. A month later, on January 30, 1951, Lieutenant Robert McGovern deployed his platoon in a skirmish line at the base of a hill near Kamyangnan-ni. All seemed peaceful enough, but he cautiously urged his men upward. The tired soldiers slipped and slid on the snow-covered rocks, their breath coming in ragged gasps from the exertion. When they were within 75 yards of the summit they began to relax slightly. The hard climb was almost finished. Suddenly, from the top of the hill, a machine-gun began raining death upon the weary soldiers. From more than a dozen fox holes, Communist soldiers popped up with weapons blazing. A bullet ripped into Lieutenant McGovern's side. Quickly he fell behind a rock for cover and attempted to bandage the wound. The platoon sergeant crept to the wounded officer's position, checked him over and suggested he head downhill to receive treatment. But Lieutenant McGovern would not leave his men to face the enemy alone. Struggling against the pain, he assured his sergeant he would be okay. "Get the men ready," he ordered. "Next time there's a break in the fire, we're going up." Slowly the enemy fire did begin to subside, and during the lull the brave lieutenant began to dodge from rock to rock, advancing on the enemy. Behind him his men watched in stunned amazement, slowly following and laying down covering fire. As the platoon neared the enemy, grenades began to rain down upon them. Quickly McGovern began to scoop them up before they could explode and toss them back at the enemy. Meanwhile, the enemy machine-gun added momentum to the death reaching out for Lieutenant McGovern's beleaguered platoon. Weak from loss of blood, the young hero stood to his feet and boldly charged the enemy position. When he was within ten yards a burst of fire tore his carbine from his grasp. Still, he continued on, firing at the enemy with his pistol and throwing grenades. He killed seven of the enemy to silence the machine-gun, but it was not enough. Behind him, his own soldiers watched in horror as the enemy numbers finally became too much. They cried out in agony as they watched the bullets slam their leader to the ground and riddle his body. Then they cried out in anger. The amazing courage of the lone lieutenant in his one-man assault provided their inspiration, his death their motivation. Determined to avenge his loss they fixed bayonets and charged the enemy, throwing grenades and attacking with such ferocity that the enemy position was over-ran and Lieutenant McGovern's men achieved their objective. Then, in sorrow, they gathered around the lifeless body of their leader. Somewhere in Japan orphans wept. The children had lost a hero. Second Lieutenant Jerome McGovern bundled himself from the cold a short distance north of where his older brother's body had fallen in the icy snow of a Korean mountainside less than a week before. He didn't know that Robert had fallen, given his life to spare his own soldiers the destruction of an enemy machine gun. Jerome's mind turned briefly to home as he steadied his hand against the cold to pen a few lines to his parents. "The Company Commander has said something is going to break in the next day or two, so I am going to turn in early so I will be prepared for any eventuality. I hope it is good." Later he would sign, seal, and mail it home. Something did break on February 10th, just eleven days after the death of Robert McGovern. The younger brother was still unaware of the loss as he led his platoon in support of his Company's assault on Hill 442 near Kumwang-ni. The company had advanced almost 300 yards when heavy mortar, automatic weapons, and small arms fire tore into their ranks. Second Lieutenant Jerome McGovern was among the wounded. Like his brother, however, Jerome would not leave his troops leaderless. Ignoring his own serious condition, he regrouped the men and organized a second assault. His own example, despite the pain he suffered, encouraged the men. As they watched him charge fearlessly into the enemy position, they could not help but follow his gallant example. The 21-year old brother of Robert McGovern lead well, fought hard, and gave it all he had. Wounded a second time, when the smoke of battle cleared, Jerome McGovern had nothing left to give. In less than two weeks the lifeless body of a second McGovern stained the snow with its blood. "Close in Life, the 2 McGovern Boys are Buried Side by Side"
So read the headline in the Washington Post on a chilly, November morning in Washington, D.C. It had been almost a year since the death of the McGovern brothers. Finally, their broken bodies had been returned home. Almost the entire Petworth community showed up for the funeral at St. Gabriel's Church where both boys had been baptized, made their first Holy Communion, and were confirmed. The Most Reverend John M. McNamara, auxiliary bishop of Washington eulogized them:"As I look at the caskets of two young men who lie before this altar in the sleep of death, I am reminded of a lesson that was written deep in their hearts. He who loves God is a Christian; he who loves his country is a patriot. But he can be neither, who is wanting in the spirit of sacrifice." A grieving family, classmates, neighbors, and a military detachment from the Third Infantry at Fort Myer followed the two flag-draped caskets across the river to Arlington National Cemetery. 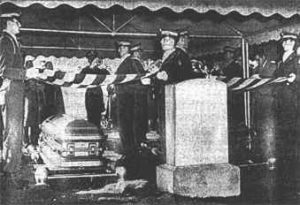 Officers of St. John's Cadet Corps formed a guard of honor, and sixteen cadets acted as pallbearers. In the place where America's warriors sleep, a firing team issued their final salute to the McGovern brothers. A bugler played "Taps" as the two brothers were slowly lowered into the ground, side by side. Above them, a headstone noted their names, the brief spans of their life, and the simple words that summed up Robert and Jerome McGovern: "To their conscience they were true and had the genius to be men." 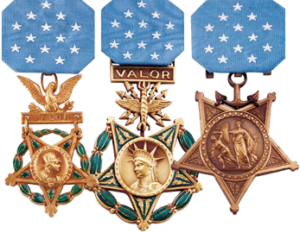 The following year the Army announced the award of the Medal of Honor to First Lieutenant Robert McGovern, and the award of the Silver Star to Second Lieutenant Jerome McGovern. For his own deeply personal reason, Halsey McGovern declined to accept. Today those medals, along with the accompanying citations and photos of the brothers, are on display at St. John's College High School in Washington, D.C.
Far removed from the war in Bosnia, St. John's College High School sits nestled on a well-kept lawn in our Nation's Capitol. It is the second oldest Christian Brother's School in the United States, established in 1851. Over the years its graduates went on to become leaders in the civil, religious and business life of Washington, D.C. None, however, would leave the lasting impact of two young men whose legacy is that they became soldiers....if only for the briefest of times, and served with honor. The pride of St. John's Cadet Corps is the rifle team, which parades the tradition of St. John's in both National and local events in our Capitol City. 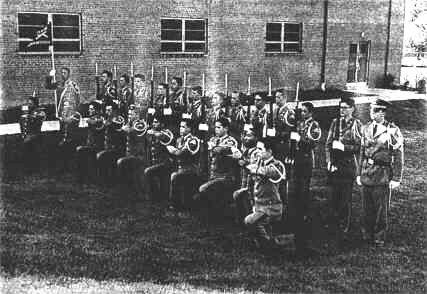 The rifle team now maintains an additional tradition, they are: The McGovern Rifles. In the years that followed the death of Robert and Jerome McGovern, their surviving brothers John and Charlie and sisters Elizabeth and Margaret Jane continued to keep Robert's program of relief to the orphans of Japan alive and flourishing. 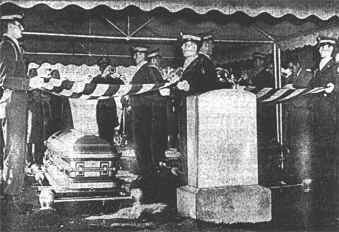 In May of 1952, a ground-breaking ceremony was held in Sappora on Hokkaido Island, Japan. The new Tenshi-in Boys Home was dedicated to the hero of Japan's orphans, the soldier who had given them the helping hand of a "big brother", Robert McGovern. 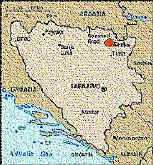 An article on Bosnia appeared in the Washington Post in March of 1997 that included a map with an area labeled "Camp McGovern". John McGovern wrote a letter of inquiry to the Department of the Army and never received a reply. Charles then contacted his congressman and was later informed, by the Army's Congressional Office, that indeed Camp McGovern had been named in honor of their brother, Bob. Charles then established contact, via the Internet, with Captain Elizabeth Hibner, the Public Affairs Officer for Camp McGovern. She was instrumental in providing the family with in-depth information concerning the camp, its history, facilities, visiting VIP's and the fact that the soldiers had taken it upon themselves to collect and distribute donated school supplies to the Bosnian children living near the camp. Charlie relayed the story of the soldiers' efforts to collect supplies to his family and friends on the Internet, resulting in many packages being sent for distribution. One example was the 7th-grade students at the Huntington Elementary School, in Calvert County, Maryland, who collected and shipped 98 pounds of supplies and clothing. Boxes of badly needed clothes, school supplies, and gifts have continued to make their way to Camp McGovern in Bosnia, just as they had when Robert McGovern appealed for help for the orphans of Japan more than fifty years earlier. Joining the effort is a student at the University of Chicago Graduate School of Business. Andrea McGovern Galo is the daughter of Charlie McGovern, niece of Jerome and Robert. After almost 50 years, the McGovern tradition of giving not only continues, the torch is being passed to a new generation of McGovern's.